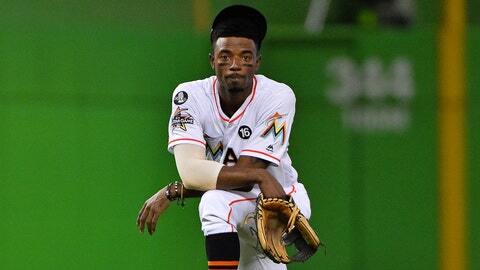 In 382 games with the Marlins, Dee Gordon hit .309 with a .724 OPS and 148 stolen bases. MIAMI (AP) — The Marlins’ latest payroll purge began not with Giancarlo Stanton, but with Dee Gordon. The Mariners get $1 million in international signing bonus pool allotment, boosting the amount they can offer Japanese star pitcher and outfielder Shohei Ohtani to a major league-high $3,557,500, just ahead of the Texas Rangers ($3,535,000). Seattle assumes Gordon’s contract, which guarantees him $38 million through 2020. Gordon said he had anticipated being traded in the aftermath of ace Jose Fernandez’s fatal boat crash in September 2016. The Gordon trade increases the likelihood the Marlins will keep outfielders Christian Yelich and Marcell Ozuna, but with the winter meetings beginning Sunday, Hill wouldn’t rule anything out. Gordon’s contract calls for salaries of $10.5 million, $13 million and $13.5 million in the next three seasons. His deal includes a $14 million team option in 2021 with a $1 million buyout, a salary that would become guaranteed if he has 600 plate appearances in 2020 or 1,200 in 2019-20 combined, and he finishes 2020 on the active major league roster.